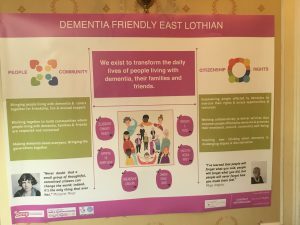 You are cordially invited to Dementia Friendly East Lothian’s Annual Gathering at the Maitlandfield House Hotel. 11th October is for everyone and we start at 9.30 am and finish at 3.30. We start with a cuppa at 9am and again you’re welcome to stay for a blether afterwards. If you are living with dementia, have dementia or are a carer, we can help you with transport. Please get in touch to find out how we can help. There is parking at the Maitlandfield House Hotel. Meeting Centres are a local club or resource for people living with mild and moderate dementia and their friends and families and for carers. They provide support and help people cope to adjusting to life with dementia. Meeting Centres started in the Netherlands 25 years ago and research shows they have a positive effect on the lives of people with dementia and their families. Professor Dawn Brooker and her team from the University of Worcester are funded by Big Lottery to develop Meeting Centres across the UK. 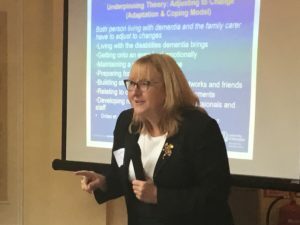 You can hear Dawn talking about her work at our Conference with the Scottish Universities Insight Institute in January HERE. East Lothian has been selected to work with Professor Brooker and her team as an early-adopter. The team will build on work already going on across our communities and help us develop our hopes and aspirations further. Much of what is happening in East Lothian fits very well with the Meeting Centre approach and the academics have much to learn from our work too. 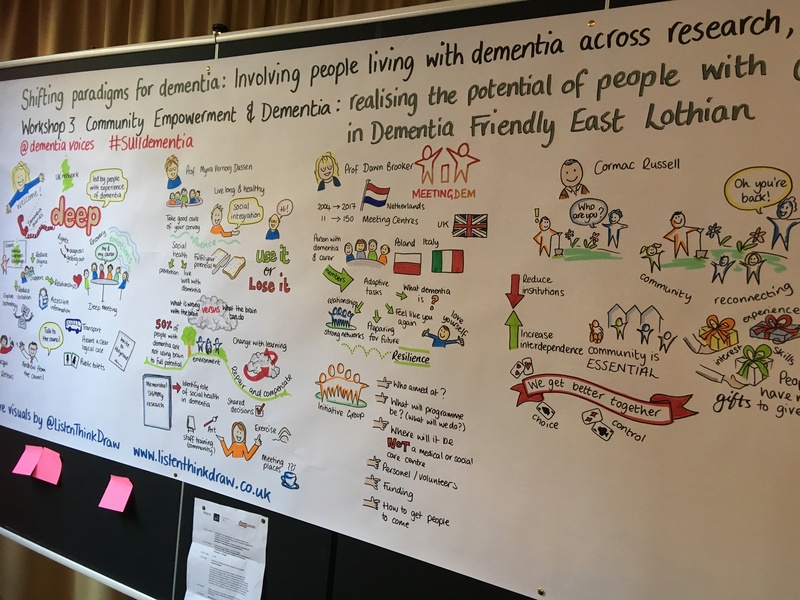 Day 1 – ‘ Living Not Existing’ is for people with dementia and carers to meet together with people going through similar experiences, to share ideas and work together. It also helps us ensure that what we do makes a real and tangible difference to daily life. 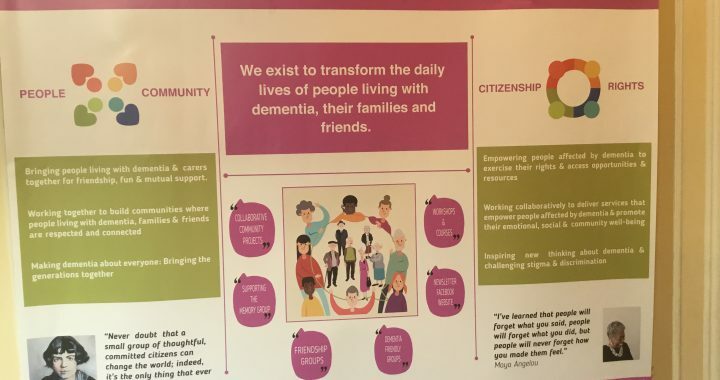 Day 2 – ‘Made here By Us’, is because dementia is about all of us and our most important relationships, activities and a lot of time happen in and with the wider community from shops, to churches and from walking and shopping to feeling we are part of something and somewhere. 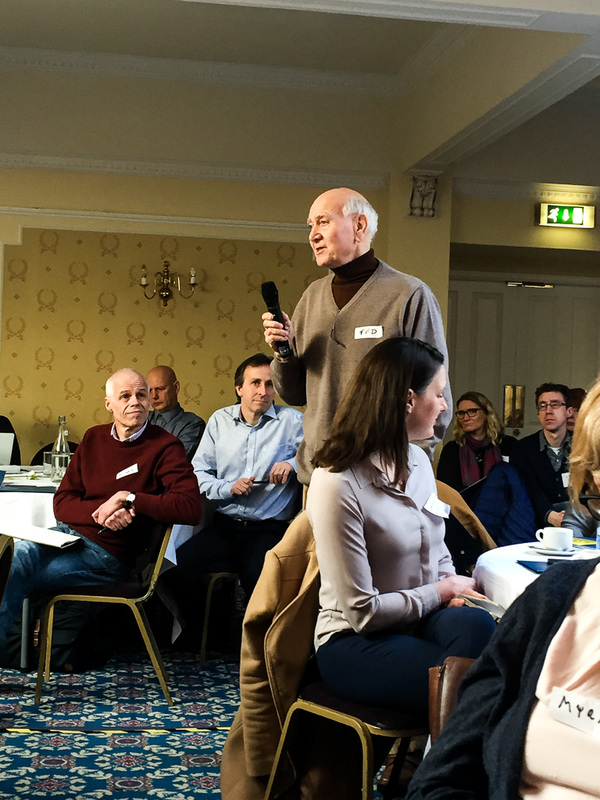 We all have a role to play – communities, health and social care teams, Area Partnerships, schools, libraries – you get the gist!! Day 2 is for everyone because dementia is about all of us and we all have much to gain by making our communities better places to live, visit and work. We are working closely with the Dementia Engagement and Empowerment Project and Together in Dementia Every Day. If you are living with dementia or are a family/friend/carer, you don’t have to book but if you get in touch with me, I know how many cakes and cuppas to order! You can e-mail me, phone or book online if that’s easier. Or just turn up. You are always welcome. For everyone else, 11th October is open to everyone. Please get in touch if you want to come along, can offer help or assistance or if you have any questions.